This is a truly masculine image, stereotypical perhaps but I'm not complaining about that! - and far more more effectively than a mere tape measure ever could. and has caused the wet T-shirt to produce a terrific sunray pattern around his shoulders. At the risk of being picky, I might question whether the pile of whatever it is he is hitting (ice perhaps?) is a worthy target, it don't look that solid! The picture is from the Marvel film, "Thor" starring Chris Hemsworth. He is the guy in the pic trying to lift the hammer. That is Chris Helmsworth as the titular character from the movie Thor. 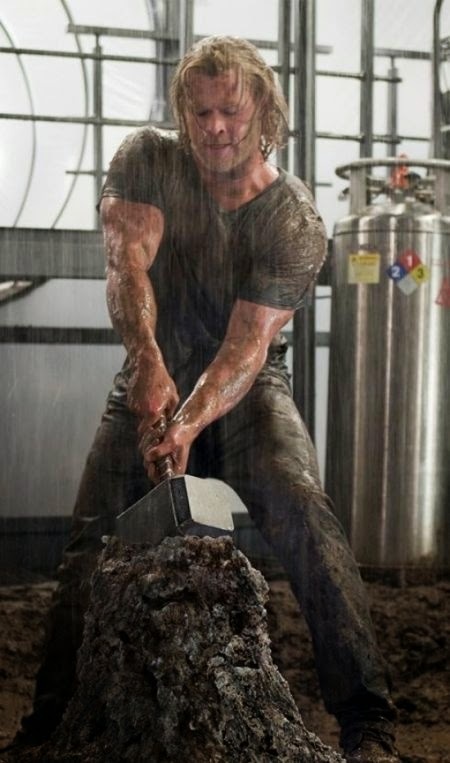 He's actually trying to lift the hammer, not smash something. It's a decent movie if you enjoy sci-fi. Thanks for the feedback chaps!